Riding the coming wave of the data-driven workplace. Over the past few years, big data has elevated workplace strategy to new levels. 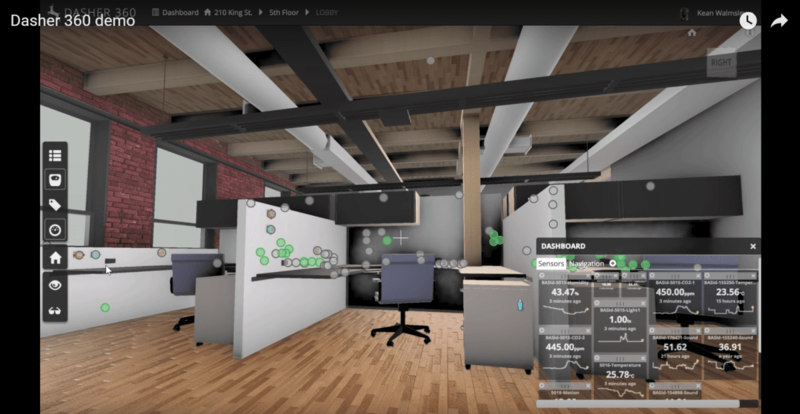 Project teams leverage workplace data to create informed design solutions that help companies achieve corporate goals and optimize their real estate. Credit this watershed moment to technological advancements in the methods used to assess how employees utilize, experience, and interact with their workspace. 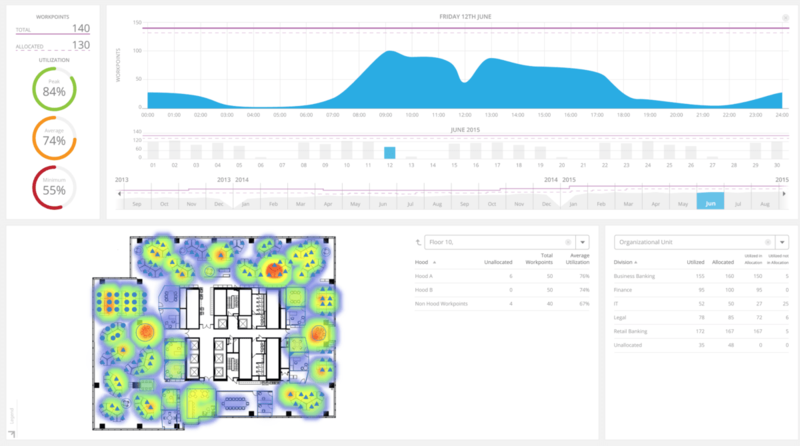 Courtesy of wearable sensors, cloud-based storage, and sophisticated occupancy software, we can now easily track how often staffers are at their desks, how frequently conference rooms are occupied, and how high the noise level is in each department. In the aggregate, these data points—collectively termed Utilization Knowledge—provide a nuanced, real-time picture of how a workspace is being used. But as data collection becomes increasingly ubiquitous, new challenges arise—namely, collecting and interpreting the data correctly to draw the right conclusions. Figure 1. A view of someone using IA Survey. Photo courtesy of IA. 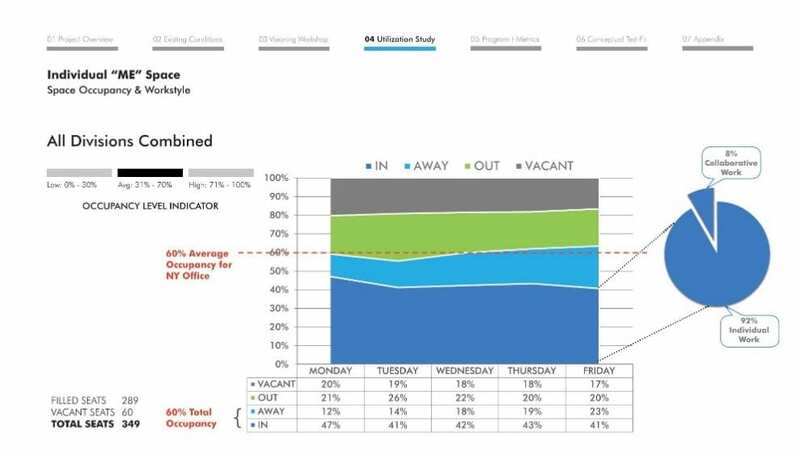 Screen shot of a utilization study. Image courtesy of IA. IA typically conducts a Utilization Knowledge survey in one of two ways: as an ongoing initiative, with the data providing continuous feedback over time, or as a single, discrete phase, usually to gather pertinent information in advance of a move or redesign. Assessing a space—even one that the client will soon vacate—is an ideal way to identify discrepancies between the office’s current state and the aspirational ideal. Additionally, the survey results often challenge long-held assumptions. For example, staff members may be requesting additional conference rooms—yet the data reveals what’s really needed are more smaller meeting spaces and breakout areas. To facilitate these efforts, IA has developed a proprietary system, IA Survey, a robust tool that combines project design software with data collection and visualization capabilities. 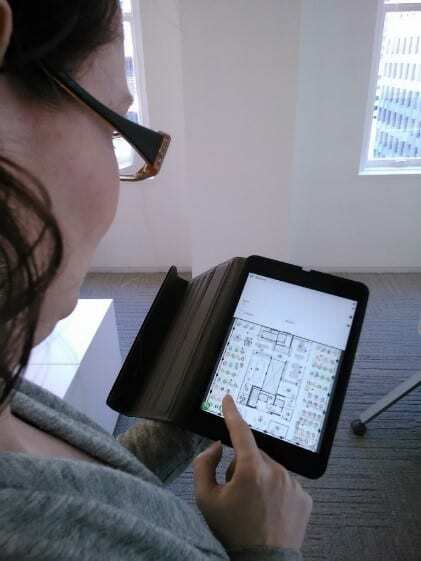 Designers also still rely on lower-tech information-collection methods (notes jotted on floor plans, data from an Excel spreadsheet), especially when assessing a soon-to-be-vacated workspace, since installing a sensor-based system would not be practical . Figure 3. Image courtesy of Serraview. Figure 4. Photo courtesy of Autodesk. 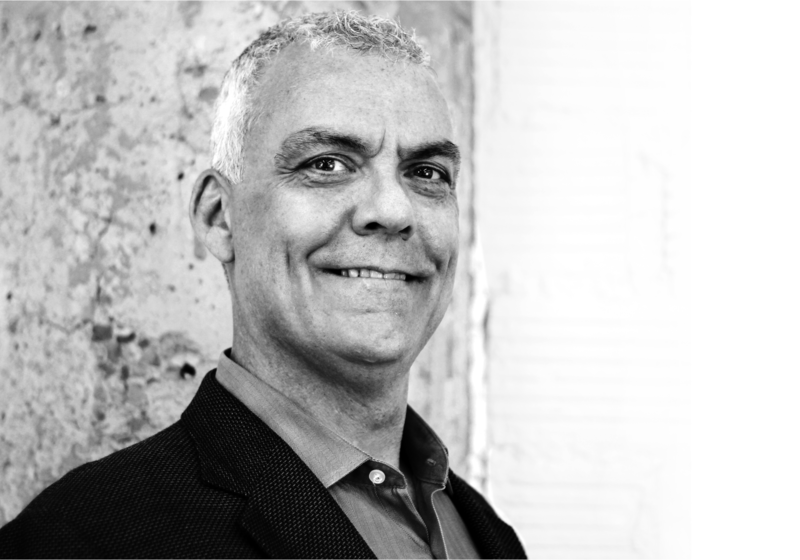 IA’s workplace strategists typically implement an ongoing study system when surveying a client’s new workplace, or one they will continue to occupy for the foreseeable future. Over time, the system can evolve or be enriched in many ways. For instance, sensors or space-management tools can be integrated at a later date. 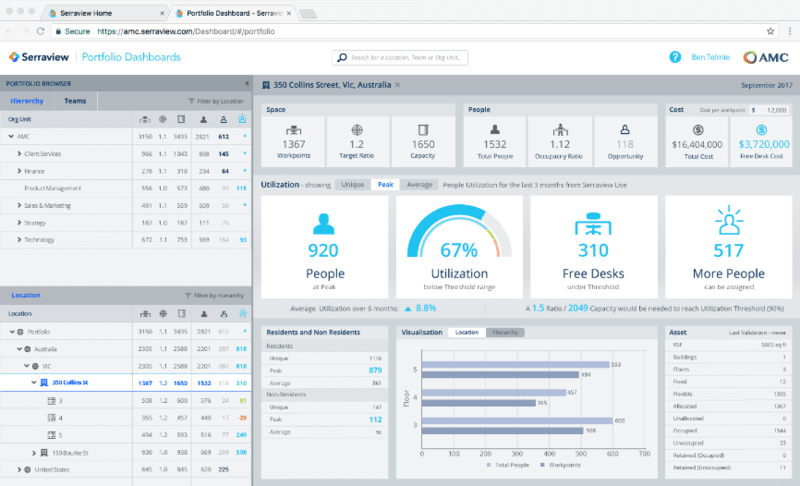 And linking the system to calendaring software—whether Microsoft Outlook or a web-based alternative—provides a real-time visual of available work and meeting spaces quickly, and enables end users to reserve them from any platform. A program that can present data in the form of reports and visuals, as IA Survey does, is invaluable. For instance, a dashboard displaying live utilization data (gathered from sensors) alongside sound levels, air quality, and other relevant facilities data (see Fig. 3) can generate insights to inform and enhance strategies. Another possibility is to import data collected from sensors into a 3-D digital model of the space (via Revit, for example). This allows stakeholders to virtually “engage” with the space from any location within. Nascent next-generation technologies will soon allow us to get an even clearer picture of an organization’s workspace. Understanding how—and by how many people—a space is being used is now common, but Location Awareness sensors allow us to identify who those people are, a capability that unlocks even more granular insights (as well as privacy concerns). Tools that help capture better Utilization Knowledge will revolutionize how we strategize, select, design, and maintain the workplace. Synthesizing existing benchmarks and human-driven data is key to aligning our clients’ real estate with their business goals, enabling a truly agile approach to space. If you enjoyed this post, check out the next part in this three part series on location awareness. Click below to read "Location Awareness: Bringing it All Together."